Emotional healing is to ward off the negative feelings of criticism, anger, guilt and resentment and replace them with positive mental thought patterns of love, compassion, pleasantness and calmness. This is in line with the Patañjali Yoga Sūtra [1:33]. The fourfold attitude as described in the above sutra, life's vicissitudes and in all relationships is conducive to peace of mind. It also enables one to overcome the distractions of the mind. They are: (1) Friendliness toward those who are pleasantly disposed to oneself (friends), (2) Compassion for the sorrowful and when one is in a painful condition, (3) Rejoicing for the happiness of others or transpersonal happiness, (4) Neutrality or non-judgmental mindset towards the wicked. Emotional healing is possible through understanding the metaphysical aspect of one's being. The science of metaphysics  has emerged since the advent of psychoanalysis. Freud discovered that the body and the psyche are irrevocably linked. Researchers in the field such as, Fritz Perls and Louise Hay have greatly contributed to the revival of the body of information that constitutes metaphysical science. This ninth rasa is the culmination of all other rasās and is one of transcendental quality. All Indian arts, including music, attempts at transcendence and is thus are of unique quality; every rasa has a corresponding method and a path leading a person on to experience the reality as defined in Indian philosophies. To summarize, the term rāga in the musical sense came to be used when it was found that a group of notes having specific frequencies roused a particular feeling. With the background of śruti the emotional effect of a rāga was clearly perceived and this marks an important landmark in the history of Indian music. Scientifically, the pair of notes bearing the frequency ratios 1:2 or 2:3 or 3:4 (a note and its octave; a note and its Pañcama; and a note and its Ŝuddha Madhyama respectively when sounded together, give a pleasing efffect. Like wise, the notes, komal Ṛśabha and komal Gāndhara have a tinge of pathos. According to an established concept of Carnatic music the emotional effect of a rāga is dependent upon the frequencies of the notes that enter into its formation as also its Jīva svarās and nyāsa svarās. The jīva svara is the index to the rasa of a rāga. The rasa of a raga changes with the shift in emphasis on notes. Jīva svara is given that name, the word "Jīva" meaning "life", because that svara defines the "soul" of the rāga. Nyāsa svarā is the ending note or svara one can settle on either by ending a composition, or a phrase. While expounding the rāga, the Jīva svara is played or sung more than all other svarās, except the ādhāra śruti śadja or sa. In Hindustani music the Jīva svara is addressed as vādi or sonant note which is the note of primary importance. In most cases it is also the note most frequently used. Thus it helps in evoking the Rasa to its fullest, acting like a beacon to show the path. Different notes determined as vādi notes can express different emotions at various times of the day and night. A vādi note is often addressed as the king. Wrong thought patterns which may cause instability and disease in the body can be replaced with positive feelings and emotions by willfully submitting to music. The four element of Indian music are: (1) Rāga: Melody, (2) Rāsa: Sentiment; (3) Bhāva: Mood and (4) Tāla: Rhythm. A combination of particular musical notes, which creates a particular emotion or rasa, could be used in therapeutic applications. An ancient text known as Rāga cikitsa has codified those rāgās which are therapeutic. Rāgās which depict the mood of love, compassion, peace and courage may be used for dissolving negative thoughts. By controlling the mental and emotional states, we could stay healthy or even reverse the conditions of ill-health [Table 4]. Thus music has a role to play in improving certain brain functions as well as in therapy of psychoneuroimmunological problems. Any psychosomatic ailments is the result of manifestation of inner conflicts, stresses, emotions and belief that are counter opposed to positive mental attitude. The emotional processes always have effects on the vegetative nervous system, as well as on the hormonal system, which, in turn, modulates immune system activity. The body is communicating to us that our way of thinking is out of harmony with what is beneficial to our well-being. All these effects are potentially significant for music-therapeutic applications because they open the prospect for using music to achieve beneficial effect in patients with autonomic, endocrine, or (auto) immune disorders. Based on many research on metaphysical causation of diseases, we have attempted to list particular melody or rāga that may help to heal a particular disease. We have based the classification of Rāgās and Rasās on the contribution of Bhatkhande. He has also classified the Rāgās based on the time of singing, which may be utilized during therapeutic applications. Our ancient scholars and musician adhered strictly to the time theory. As a general rule, Bhatkhande has taken up tīvra madhyama as indicator of time. The evening and night Rāgas employ tīvra madhyama, while the morning Rāgās use Ŝuddha madhyama. Each rāga is capable of producing a particular aesthetic mood or rasa. As discussed earlier, Bhatkhande has taken four important Rasās for the musical purpose. Depicting of a particular rasa or mood from a rāga depends upon the piece of the melody, the performer, tempo, rhythm, time of rendering the piece of melody etc., The willful submission to the selected Indian Rāgās, brings out agreeable Rasās (aesthetic mood) such as love, compassion, courage and calmness in the listener. This aids in emotional healing and thus used in therapeutic applications. Bhatkhande also has given the equivalent Carnātic Melās based on Venkatamakhi's system to that of Hindustāni Thāt's. Hence we have attempted to correlate Rāgās, Rasās and some of the common ailments, which could be healed in the process, in Hindustāni as well as Carnātic music. Listening to the music and allowing the notes of the melody work on our mind-body and spirit, helps in inter and intrapersonal restorative healing and a redefinition of inner strength. In this regard, an integrated approach of following healthy diet, prāṇāyāma, āsana , meditation, attitudes of detachment and discipline all work in harmony as a synergistic whole to quicken the healing process. 1. Metaphysics means beyond physical layer or annamaya kośa which consists of prāṇamaya kośa, manomaya kośa, vijñanamaya kośa and ānandamaya kośa. 2. Lise Bourbeau. Your Body's Telling You-Love Yourself. Canada: Les Editions ETC Inc.; 2001. 3. Louise L Hay. You Can Heal Your Life. New Delhi: Hay House Publishers (India) Pvt. Ltd; April 2007. 4. Gabriel Van Loon. Charaka Samhita, Handbook on Āyurveda . Vol. I. Varanasi: P.V. Sharma and Chaukhambha Orientalia Publishers; 1981. (Ch .Sa1#102-108). 5. Esther M. Sternberg. The Balance Within-The Science Connecting Health and Emotions. New York: W.H. Freeman and Company; 2008. 6. Subramanian SV, Ackerson LK, Subramanyam MA, Wright RJ. Domestic violence is associated with adult and childhood asthma prevalence in India. Int J Epidemiol 2007;36:569-79. Epub 2007 Feb 28. 7. Cacioppo JT, Berntson GG, Malarkey WB, Kiecolt-Glaser JK, Sheridan JF, Poehlmann KM, et al. Autonomic, neuroendocrine, and immune responses to psychological stress: The reactivity hypothesis. Ann N Y Acad Sci 1998 May 1;840:664-73. 8. Kerstin Uvna¨s-Moberg. Oxytocin may mediate the benefits of positive social interaction and emotions. Psychoneuroendocrinology. Elsevier Science Ltd ; Vol. 23, No. 8, pp. 819-835, 1998. 9. Peter Merchand. The yoga of the nine emotions. Destiny Books, Vermont; 2006. 10. Sairam TV. Rāga Therapy. Nada Centre of music therapy; Chennai 2004. p. 33. 11. Mona Lisa Chanda and Daniel J Levitin, The neurochemistry of music, Trends in Cognitive Sciences, Vol. 17, No. 8, pp.179, April 2013. 12. Mukerjee R. "Rasās" as Springs of Art in Indian Aesthetics", The Journal of Aesthetics and Art Criticism, Vol. 24, No. 1, Oriental Aesthetics. The American Society of Aesthetics, (Autumn, 1965), pp. 91-96. 13. Prasad G. I A Richards and Indian Theory of Rasa. Delhi: Sarup & Sarup Sons; 2007. p. 9. 14. 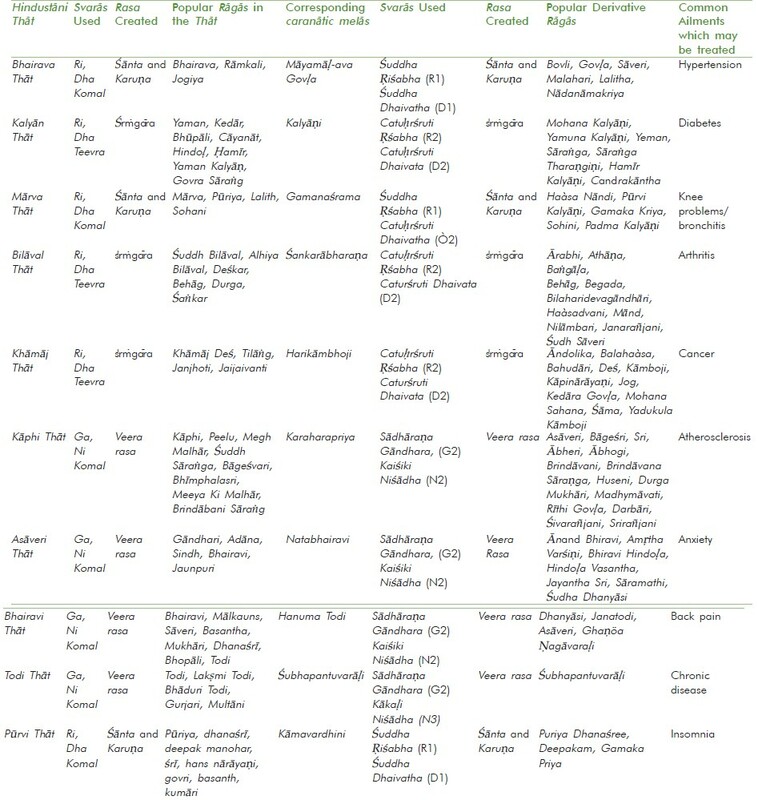 Prajnānaṇda S. Music of the Nations. Chennai: Rāmākṛśṇa Vedāṇta Math; 1973. p. 49. 15. Murthy PS. South Indian Music. Vol. 5. Chennai: The Indian Music Publishing House; 2006. p. 170. 16. Koelsch S. The neurosciences and music III - Disorders and plasticity. Ann NY Acad Sci 2009;1169:374-84. 17. Nayar S. Bhatkhande's Contribution to Music, A Historical Perspective. Bombay: Popular Prakashana; 1989. p. 159. 18. Sampathkumaracharya VS, Ramaratnam V. Karnataka Sangeeta Deepike. Mysore: Published by D.V. K. Murthy; 2000. p. 172. 19. Lewis MD, Haviland-Jones JM, Feldman Barrett L. Psychology. Handbook of Emotions. New York: The Guilford Press; 2010. p. 283.